It was 10.15 on Tuesday 16th March when I left the car-park at Tourist Office in Carlingford. I followed the signs from the village, westwards up the street past the butchers shop on the corner. After a steady climb (and a few stops to admire the increasingly spectacular view over the village and across Carlingford Lough) I reached the Gap where I turned left and visited Barnavave. After a break here to take on some water I headed straight in the direction of Slieve Foye which had been beckoning me seductively while I dallied on Barnavave. When I arrived at the summit , after a brisk walk and gentle ascent , I was not disappointed. As the wind whistled around me at the trig point, I thought to myself : it doesn't get much better than this. 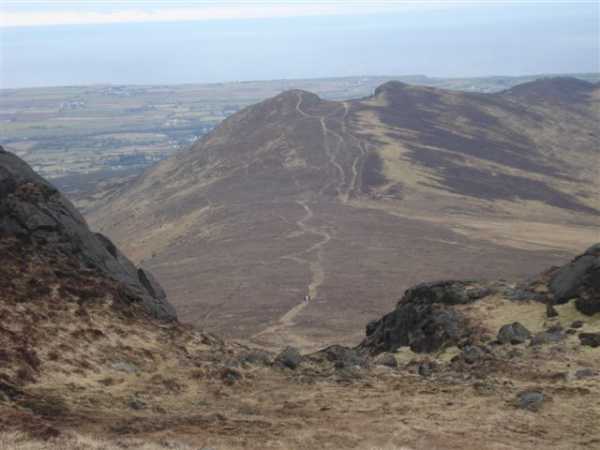 The summit is interesting and ruggedly different to those that I'm more used to in my beloved Mournes (which I admired, with a sigh, in the distance). The views from Foye are immense; the rest of the Cooleys,Slieve Gullion, Carlingford Lough, Warrenpoint , Rostrevor etc......and of course the Mournes, which looked great from an angle I'd never seen them from before. It must have been my lucky day. While gazing into the distance, I was joined on the summit by a young local couple with an Alsatian dog(whom I had spotted earlier near the Gap). We started to chat and in a short time I had learned about the history and folklore of the area. If my teachers at school , almost 50 years ago !, had been as enthusiastic and knowledgable as these two I may have learned more !! They even advised me on what book to buy to read up on local history etc.